Fukushima radiation isn’t the only radiation we are exposed to in modern times; we have to protect ourselves from microwaves, cell phones, cell phone towers, and much more. Fortunately, there are numerous ways to protect ourselves from radiation exposure and even reverse radiation damage. Apple pectin, for example, along with other fruits that contain this soluble fiber and polysaccharride carbohydrates are great radioprotective agents. Yuri Bandazhevsky, the once director of the Medical Institute of Gomel in Belarus, documented the chronic incorporation of caesium 137 (Cs-137) in the organs of children living in contaminated areas after the Chernobyl incident. A paper published in 2003 examined the organs of 52 children up to the age of 10, who died in 1997. The highest accumulation was in the endocrine glands, in particular the thyroid, the adrenals, and the pancreas. The South China Morning Post has already reported much higher levels of thyroid cancers in children post Fukushima – in some areas as much as 10 times higher. In Banazhevsky’s studies, high levels of Cs-137 were also found in the heart, the thymus and the spleen. Children have a higher average burden of Cs-137 compared with adults living in the same community, typically 2 to 3 times and we can expect the same from the Fukushima fallout. Following the Chernobyl incident, children were given pectin powder in order to combat radioactive isotope exposure. The researchers gave 64 children milled apple-extract containing 15-16% pectin, with the average Cs137 load in the group of children being approximately 30 Bq/kg body weight. The pectin was so effective, it reduced the Cs-137 load by up to 62% in just one month. Other fruits besides organic apples that are high in pectin include grapefruit, oranges, and lemons. But in citrus, as in apples, most of the pectin is in the peel. You can utilize citrus peels in many recipes by using a grater to scrape off the ‘zest’ of the fruit to flavor soups, breads, salads, and more. Apples are easier to eat, since most people just consume the entire fruit, including the peel. You can also utilize many berries for their pectin, too, including raspberries, strawberries, and blueberries, to name a few. Of course pectin is only one of many foods that help you detox safety and gently. 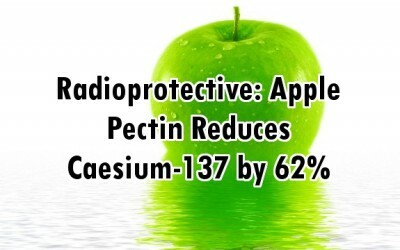 Pectin binds with the radioactive isotopes and then is ushered out of the body through our normal excretory functions. Our digestive tracts actually don’t digest pectin very well, but this is why they are a great chelation agent, since they absorb caesium and other toxins and help to remove them from the body.